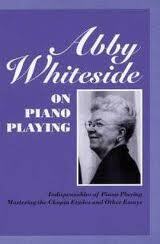 Abby Whiteside (1881–1956) was an influential American piano teacher. She challenged the finger-centric approach of much classical piano teaching and instead advocated a holistic attitude in which the arm and torso are the conductors of a musical image conceived first in the mind and soul. The Hanon reference evokes a teacher at the Oberlin Conservatory who assigned all his students the same package of taxing Schmitt five-finger exercises for the piano, op. 16 (c1922) Pupils were instructed to practice these on a daily basis for months, if not years, in pursuit of a BIG, enviable Technique. Overdosed on Schmitt, I desperately sought a teacher change in my Freshman year, jumping from one studio to another, meeting up with the same fruitless prescribed regimen in vogue at the time. And most often it led nowhere, causing pain and injury by its rigid embrace of a fixed hand position. Obviously, Abby Whiteside, sensed a need for REFORM, that predated the referenced scourge at Oberlin and other conservatories and made a whopping contribution in the teaching arena. But so did others, like Mildred Portney-Chase who became personally enlightened through her self-explorations, carefully logged in Just Being at the Piano, Berkeley Press. A changed consciousness about piano playing, however, is often limited by the written word, so the physical presence of a teacher beside a student is the ideal. Still, in this day and age, the Internet imports Masterclasses where distinguished mentors impart wisdom about technique, phrasing and overall musicianship. In this spirit, I often go You Tubing, like others surf the Malibu waves, expanding my consciousness. Watching an artist flowing in and out of phrases with fluidity is for me, a prime learning experience. Having an up front and personal teacher demonstrating the use of bigger energies in playing the piano, in lieu of fingers down reliance, is always a nice start. Enrichment of private lessons with concert attendance and selective You Tube excursions fills out the learning triad. Yes, I love her playing….glad you had an opportunity to partake.